The team of Disney and Pixar have had some massive hits, but their biggest in terms of initial box office and adjusted for inflation grosses outside of Toy Story 3 is that of Finding Nemo. It was kind of an odd pick as the story is simple: father searches for lost son. And the appeal was simply the branding of what the studio had delivered previously. Nemo was Pixar at the height of it's critical and commercial power-a kind of culmination if you will. It didn't hurt that the quality of the movie was nothing short of excellent. Twelve years down the road and Pixar has experienced something of a rough patch with originals like Brave not stroking the critical fire as highly as expected and sequels like Cars 2 (why? WHY?!?!) and Monsters University (I really enjoy this one, regardless) doing more or less what people expect if nothing more. And so, while Pixar is certainly on something of an upswing after this summer's smash Inside Out and looks to have another hit on their hands with The Good Dinosaur this Thanksgiving there is nothing better than a safe bet and thus why we are now getting a peak at a sequel that was apparently warranted after thirteen years. We'll be getting another Toy Story feature, a sequel to The Incredibles and another Cars film (why? WHY?!?!) as well as some original sprinkled in there somewhere over the next few years, but today is about Finding Dory and, if nothing else, the trailer plays off the charms of the original's three leading characters in hopes audiences will remember how much they loved Marlin, Nemo and of course Dory to the point they're willing to spend a whole lot of money on them next summer. Ellen DeGeneres returns as the voice of Dory with Albert Brooks, Diane Keaton, Eugene Levy, Ed O’Neill, Idris Elba, Dominic West, Kaitlin Olsen, Willem Dafoe, and Ty Burrell also starring. 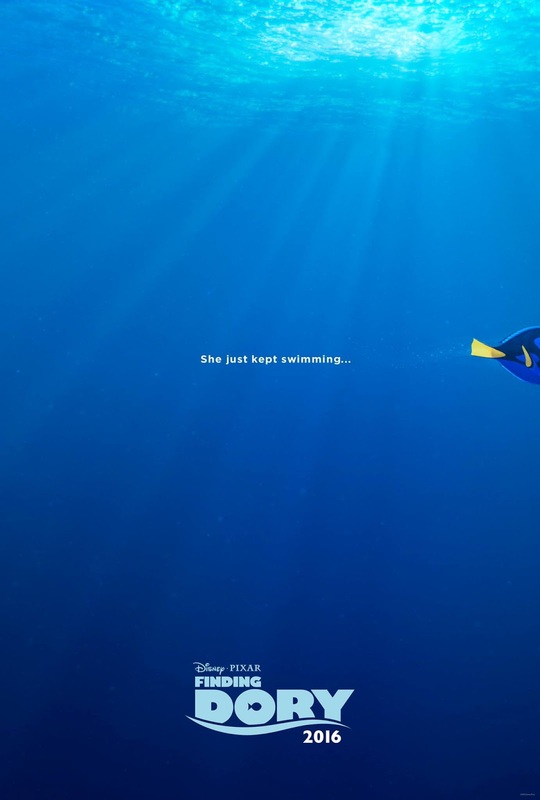 Finding Dory opens on June 17, 2016. Joining DeGeneres on stage this afternoon were Ed O’Neill (“Modern Family”), who lends his voice to Hank, a cantankerous octopus; Ty Burrell (“Modern Family”), the voice of Bailey, a misguided beluga whale; and Kaitlin Olson (“Always Sunny in Philadelphia”), who voices Destiny, a kind-hearted whale shark. Oscar®-winning director Andrew Stanton (“Finding Nemo,” “WALL•E”), co-director Angus MacLane and producer Lindsey Collins (co-producer “WALL•E”) offered new details of the all-new story, which reunites Dory with friends Nemo and Marlin on a search for answers about her past. What can she remember? Who are her parents? And where did she learn to speak Whale? Also featuring the voices of Albert Brooks, Diane Keaton and Eugene Levy, Disney·Pixar’s “Finding Dory” swims into theaters June 17, 2016.